What is a story setting? Every story has a setting, and primary-school children learn to analyse story settings in other people's writing before using the same techniques in their own fiction writing. Read on for details of how story settings are taught in KS1 and KS2. A story setting is the location in which a story takes place. The setting could be a school, someone's home, a witch's lair or Mars! How are story settings taught in school? Agatha sat gloomily on the old, rickety wooden chair that squeaked every time she moved. The desk felt grainy and chalky under her sweaty palms. There were only three other children in detention, who scribbled manically on their papers and did not dare look up for a second. A grey-faced teacher with dark eyes stared at her. His skin seemed as thin as dusty paper and she was scared to hold his gaze for more than a second. The walls were yellowed with age and the paint was peeling and cracking like dry earth. There was a disgusting smell of boiled cabbage coming from the corridor. Here a teacher might ask the class to think of a word to sum up the mood of the setting; replies might include: 'dismal', 'depressing', 'scary', 'miserable'. The class might then be asked to actually pick out words and phrases from the text that back up their opinion. The teacher might also draw attention to the fact that we are given a feel for four senses: sight, sound, touch and smell. Children might be asked to find references to each of these four senses. The teacher may also pick up on the use of similes and see if the children can spot them ('skin seemed as thin as dusty paper' and 'paint was peeling and cracking like dry earth'). They might be asked why these similes have been used and why they are effective. How do children useIn asking these questions, the teacher is making the class aware of how an author creates a mood in their writing. The next step is to encourage the children to do the same in their writing. How do children use story settings in their writing? A teacher will spend a few days reading the story to the children and giving them tasks that help to deepen their understanding of it. This could include drawing a story map or mountain, writing descriptions of characters and drama tasks. The point of this activity is to make children think about describing a setting in a story, rather than rushing ahead and simply describing the action (a common reaction!). 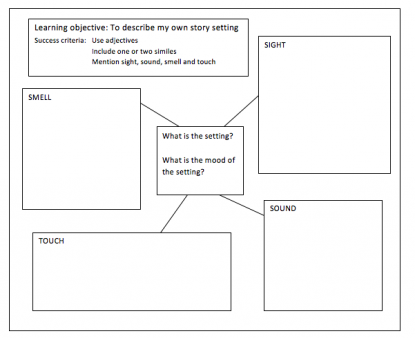 When writing the section of their story that describes the setting, the children would be asked to refer to this sheet and offer a full and detailed description so that the reader gets an idea of what is in their head. What is a spider diagram?